Newest baby girl is due in 57 short days! I am currently working on her coming home gown but other than that, I have not sewn one thing for her. I can't believe it. Part of my problem has been there is no shortage of baby things in the Mimi Closet. Here is the wardrobe already awaiting LB! As you can see, all of it is awaiting an appointment with an iron. These are things that either I have made, friends have made or are left from my girls and a few purchased things that are smocked. This is just NB-12 months. 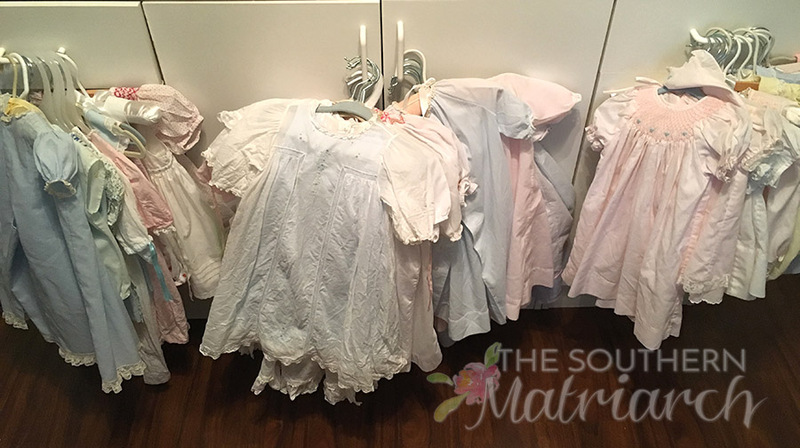 There are over a dozen daygowns in there alone. 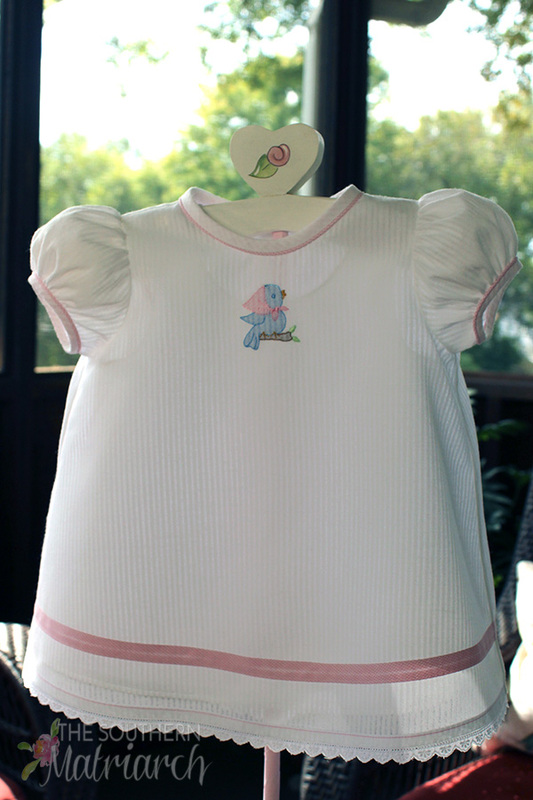 She does have one new daygown in there, it is Bella from Classic Sewing Magazine that I shared here. She won't be going nekked for sure. But still every new baby deserves a few things that are just for her. So Mimi made her just a sweet, simple dress. It is made from a Spechler-Vogel fabric known as Skip Dent. It is poly/cotton with a tone on tone stripe. I piped it with Susie's Ready to Smock piping, also poly/cotton. No, poly/cotton isn't always my first choice, but this baby girl is Momma's #3 in three years. Mimi thought momma just needed an ironing break every now and then. For a more casual look, I did a piped French binding at the neck instead of entredeux with lace or Swiss trim. The sleeve bands are piped as well. You know me, if its not nailed down, pipe it. 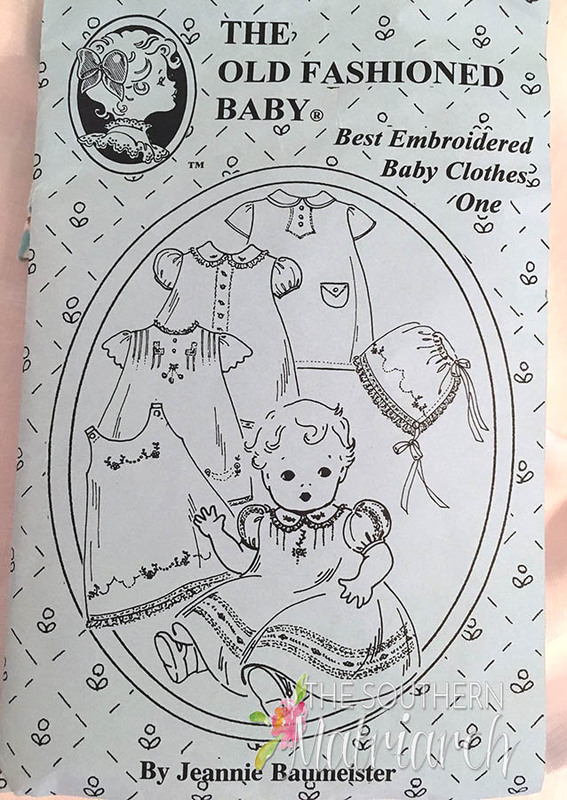 It is no secret that my go to patterns for older babies/children are Children's Corner patterns. For new babies my go to is almost always The Old Fashioned Baby. 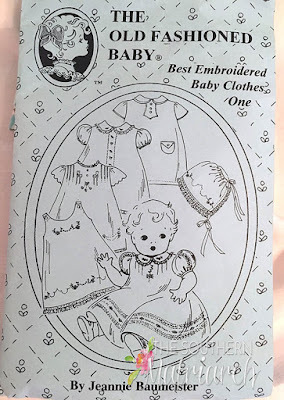 This pattern, Best Embroidered Baby Clothes I, appears to be out of print but often comes up on Ebay or Etsy. I made the small size for 7-13#. The sweet little bluebird is from Applique for Kids. She just makes you smile. The lower skirt is trimmed with bias band that I made from deconstructed piping. (Look for a tutorial in a few days.) 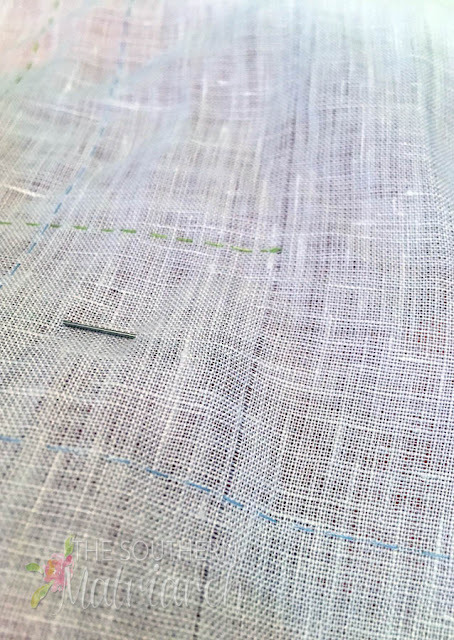 The hem is finished with a tiny Swiss trim. 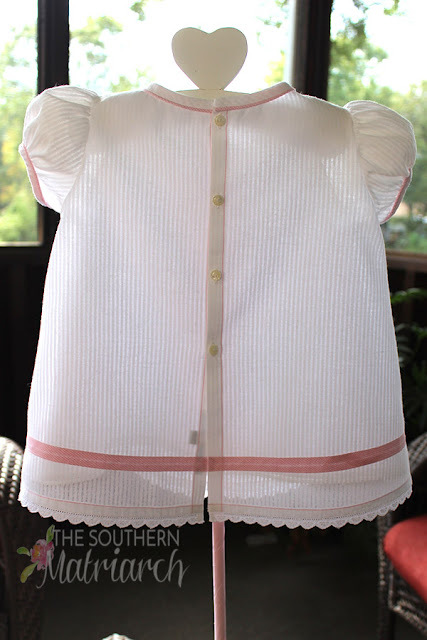 Poly/cotton or not, sweet vintage mother of pearl buttons are used down the back. 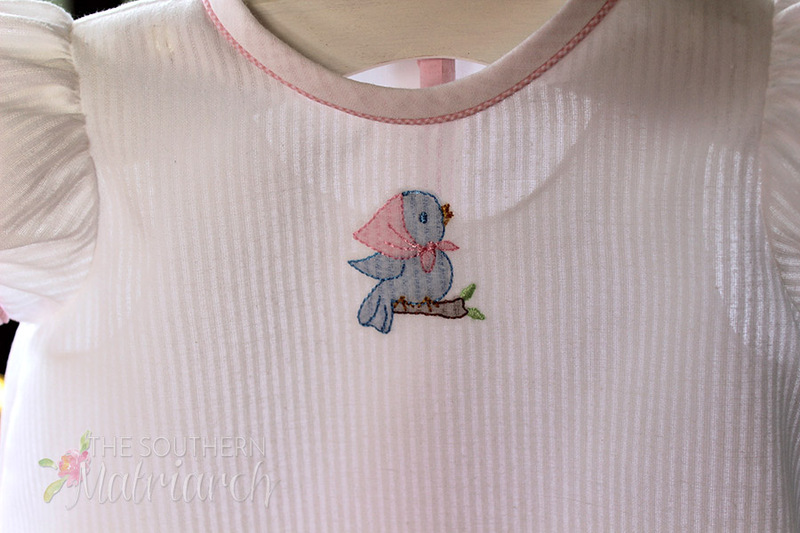 Just for fun, I stitched the button band and hem with the same pink thread I used for the bluebird's kerchief. Ignore that dark that square shadowing through, its the size tag. Back to the project at hand, a coming home gown for this sweet baby girl. It doesn't look like much just yet, but it will. Until then faithful reader, keep stitching. I love your blog and your beautiful work. I have an ironing question: how in the world do you iron those darling puffy sleeves after they have been washed and are wrinkled? Do you have a secret method? Chay, thank you. 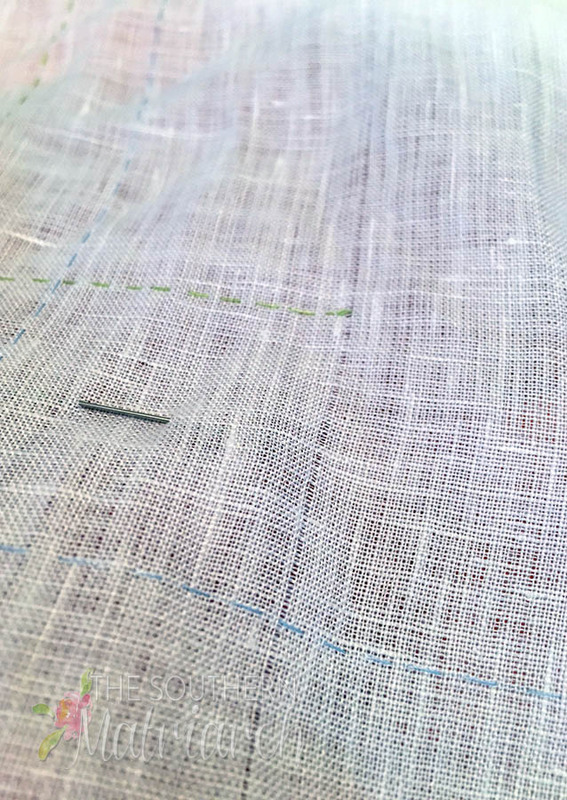 I swear by two things, one tulle stuffed into the sleeves when damp and using a June Tailor Tailor Board, link is in this post: http://www.southernmatriarch.com/2009/12/santa-for-sewists.html I am able to use the little extensions on the tailor board to get my iron into the sleeve. What a lucky little girl she will be with all those adorable clothes. Thank you. It is a joy! All those clothes! She's a lucky baby.